The forearm is composed of two bones – the radius and the ulna. The ulna is on the pinky finger side of the forearm, while the radius is on the thumb side. There are two radio-ulnar joints. The distal radio-ulnar joint is relatively non-mobile and forms the wrist with the carpal bones. The proximal radio-ulnar joint occurs just distal of the elbow and is the site of pronation and supination of the forearm. In anatomical position (tadasana with the palms facing forward) the forearm bones lie parallel side-by-side. 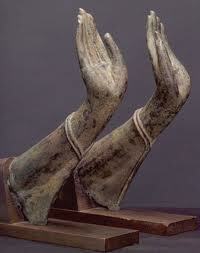 When the palms turn to face backwards, the bones cross into pronation. Many yoga poses use the forearm as a base of support. We’ll go more into it another day, but developmentally the hand develops from the pinky toward the thumb. Come into sphinx making fists with the hands, pinky side down. Press the pinky side of the hand and the full length of the ulna into the ground. This will bring you into the back of the shoulder girdle. Now roll each finger down into the ground, slowly unfolding the hand. By the time all fingers have rolled down to the ground, the forearm has fully crossed rooting the radial hand into the earth. Notice that this offers more support for the front of the chest to lift up out of the ground. Once the forearms are fully rooted to the ground, notice the difference between pushing the arms into the ground, where the forces travel from hands to tail, and pulling oneself toward the hands. This will engage different muscles in the shoulders and thorax. Now come to standing in warrior two and let the middle finger represent the midline of the whole arm. This midline travels down the forearm between the radius and the ulna. Start with the palms up externally rotating in the shoulders. Now rotate the hands down from the proximal radio-ulnar joint just below the elbow allowing the radius to make an overcurve and the ulna to make an undercurve around the midline of the arm.